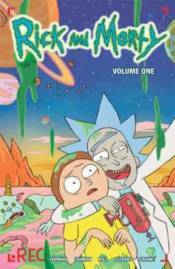 The hit comic book series based on Dan Harmon and Justin Roiland's hilarious [adult swim] animated show RICK & MORTY is now available in its first collection! Join the excitement as depraved genius Rick Sanchez embarks on insane adventures with his awkward grandson Morty across the universe and across time. Caught in the crossfire are his teenage granddaughter Summer, his veterinary surgeon daughter Beth, and his hapless son-in-law Jerry. This collection features the first five issues of the comic book series, including ''The Wubba Lubba Dub Dub of Wall Street,' 'Mort-Balls!' and more, along with hilarious mini-comics showcasing the whole family.